It is only five months ago in October last year that I dropped into Territorio Era for the first time and wrote this quick post. Back then I thought it was awesome but even in the short time since then it has become clear that awesome doesn’t cover it. The bare facts are remarkable enough: 102 wines by the glass, 72 of them generosos, top class (even show) cooking and friendly/cheeky service in a space smaller than some of those bizarre show apartments in Ikea and in a location even more bizarre. To say this is a diamond in the rough is to understate the situation considerably (although the market is gentrifying rapidly). But the bare facts aren’t even half of it, because we are not talking about any wines here. 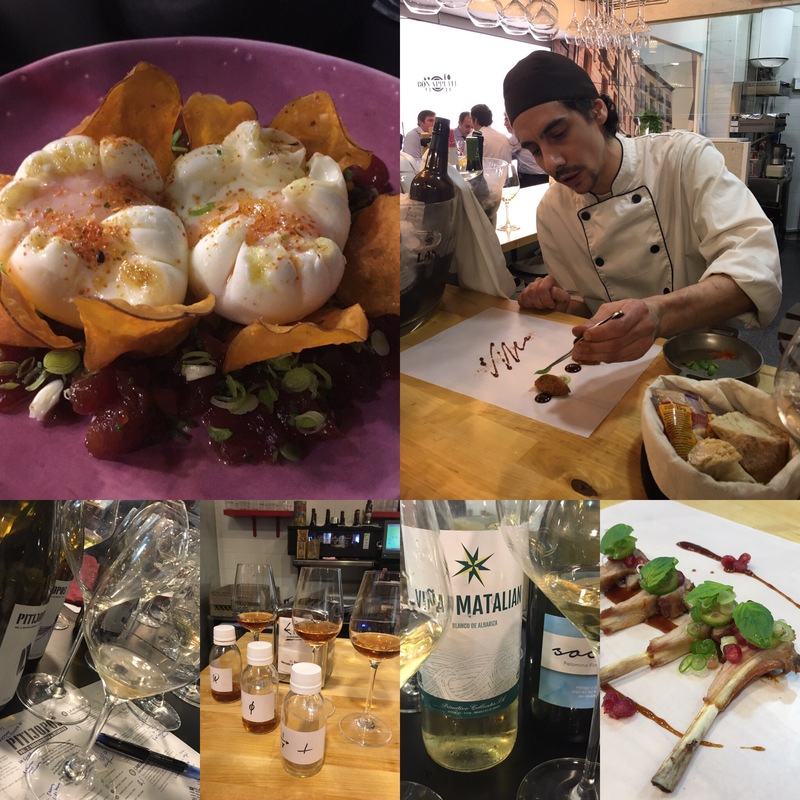 The half dozen folk that follow this blog will have seen the name Territorio Era in a hundred posts or more, and next to some stuff that you would struggle to find in restaurants of far greater fame. Notable names would include Fino La Barajuela (by the glass! ), la Panesa, Encrucijado, Precede, Las Machuqueras, Socaire, and Monopole, but for me the greatest thing is the variety. You can rock up and try stuff you might never have thought about – jura, arbois, coteaux du layon, madeira, macvin, you name it – and if you fancy a champagne by the glass or a bottle of a small grower producer you are also in luck: David, the jefe de sala and executive sommelier, has a terrific range of champagnes. Neither are we talking about just any food, because this is absolutely top quality. The huevos rotos con atun, las papas rellenas, los boquerones, el salpicon de gambas, el atun, el pargo con salmoretto, el cordero a la pekinesa, los callos a la tailandesa … the list could go on and on. All of them are prepared from top quality ingredients with fantastic imagination and considerable skill by Diego (pictured above). Just this week I had the pargo twice and the second time noticed an additional smokey tang: they had used sarmiento (wood from the vine), which burns very fiercely and creates a pungent smokey taste. And as if all that were not enough these guys are the absolute salt of the earth. In the five months I have known them they have always been willing to help out, whether with finding a hard to get wine, arranging a special menu or hosting a cata or dinner. On one unforgettable occasion they opened the entire market for dinner on a Sunday night. They are great lads. So get down to Territorio Era while you still can. I will see you at the bar.